In addition to adequate oral and overall health, successful dental implants require plenty of existing jawbone structure. 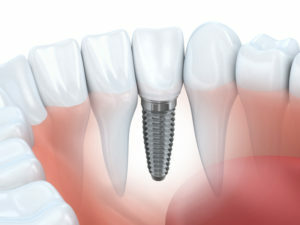 Without it, the dental implant has difficulty anchoring. And without a sturdy anchor, implant failure is likely to occur. Fortunately, bone augmentation can help make implant dentistry a possibility for patients who have experienced even significant bone loss as a result of their missing teeth. In addition to bone augmentation, nerve repositioning may be necessary for dental implants in Parsippany. Bone Augmentation: What Is It? Bone augmentation builds up the jaw bone to create enough room for the dental implants. The most common type of bone augmentation for dental implants is a bone graft, which uses natural bone from elsewhere in the body (or, occasionally, from a cadaver) to add more structure to the jaw bone. When bone grafting is required, a healing period of several months may be necessary before the dental implant procedure can begin. The chin or the back part of your lower jaw are both excellent choices for bone grafting for dental implants — especially for replacing a single missing tooth. However, if there is not enough bone matter in these locations, the hip or shin may be chosen for grafting. This is often the case when several dental implants are needed for the replacement of many missing teeth. For bone grafting from the hip or shin, the procedure is carried out in a hospital setting under general anesthesia. Another common type of bone augmentation preceding dental implants in the top molars is a sinus lift. The aim of this procedure is to increase the height of your upper jaw by filling the sinus cavity, which rests on top of the back teeth, with bone. Often, a patient’s jaw is simply not wide enough to support dental implants. A ridge expansion may be the best choice in these cases. To perform a ridge expansion, your dentist separates the upper jaw and packs new bone into the space left between. The ridge expansion can be performed in the dentist’s office under local anesthesia. The inferior alveolar is the nerve that runs through the lower jaw. It’s what allows you to feel your lip and chin — and when too much bone has been lost, it may be risky or downright impossible to place dental implants without damaging this nerve. When that’s the case, your dentist may perform nerve repositioning, moving the inferior alveolar to protect it from the dental implants. If you’ve got remaining questions regarding bone augmentation, nerve repositioning, or anything else related to your dental implants, please get in touch with your dentist in Parsippany today. Rauchberg Dental Group is always happy to answer your questions regarding tooth replacement, and we’d love to discuss your eligibility for dental implants, too. Contact us today!